I designed my new Davidson titanium bicycle to be a travel bike with multiple personalities, and the Paragon Machines Works dropouts are a key point of the design. With track-style rearward facing frame ends, the MkV can easily be kitted as a fixed gear or even fully velodrome-legal track bike. But by having 130mm dropout spacing and derailleur hanger, the bike is ready to be a regular road bike. Like many designs, there are of course compromises. As a track bike, 130mm spacing is a little annoying when all regular track wheels are 120mm; luckily the springy nature of the MkV’s titanium construction means that I can tighten the rear triangle down unto a 120mm wheel without coldsetting the frame. As a road bike, the rearward facing dropouts make an ordeal out of swapping the rear wheel in and out. Greasy fingers from manually maneuvering the chain. 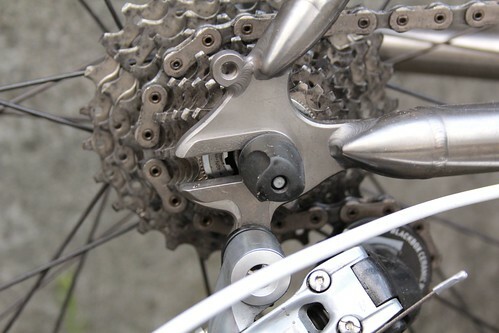 However, a large number of time trial framesets share this problem as they use similar dropouts with derailleurs so that the tire can be positioned close to the seat tube.